In search of the perfect outfit part 3 – Happy ending !!! Sorry this post has come so late but as you know from my previous post here and here, how I was in search for perfect outfit and I am very happy to tell you that it had a very happy ending. Once I ordered my lehengha and sari online, I was really excited. It felt so good to find something you really wanted and to wait for it. I was like a little girl a few days before Christmas, waiting for Christmas morning. I was slightly worried as there was not many days left before I left Sydney. I thought it would be safest for me to get them delivered to work and I was in a waiting game. I began worrying when I had only 3 days left and I still hadn’t heard about or received the package. I was in panic mode and had called and emailed the store twice already. The next morning I receive an email from one of my colleagues letting me know that there was a package for me at the front desk. I was so relieved and happy that I went running to the front desk. It was the package I was expecting. I also learnt that it had been delivered 2 days ago but they had failed to inform me. I was a bit annoyed but I it was short lived because I was relieved to finally get the lehenga and sari. 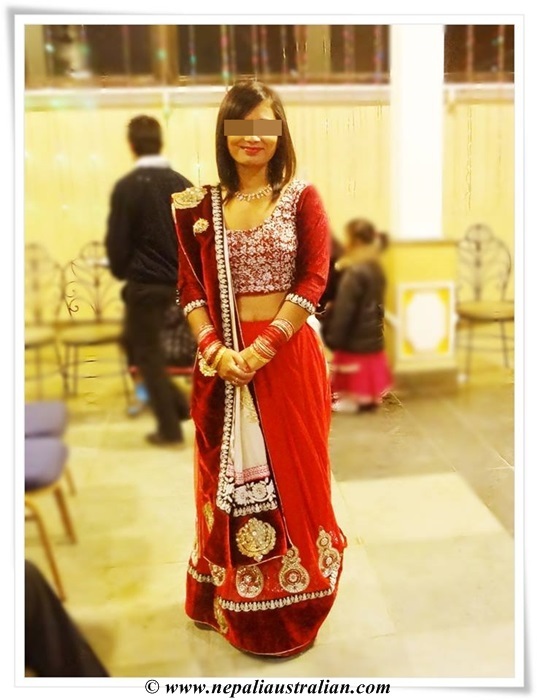 This entry was posted in Fashion, Personal and tagged australian, lehengas, M from nepaliaustralian, Nepali, Nepaliaustralian, outfit, outfits, saree, Sari, Silk Saree Surat, Wedding. Bookmark the permalink. Looks fantastic! I love all of them, especially the last one! I love these photos. The clothes are wonderful . You look absolutely gorgeous! Thank you so much my dear. I have just posted the interview you sent, sorry for delay. Take care. Gorgeous!!! You look just fabulous!! You look gorgeous. Love your collection. Thanks a lot for sharing. Thank you Alisha. Sorry we could not meet. I was waiting for your reply but then I had to come back. Take care dear. Loved all of it, loved that beaded belt! Thanks for sharing. Do write if you can recommend some shops for good Lehengas. I’ll get one when I’ll go home this year. I highly recommend shopping online than going to shops and boutiques in Kathmandu as they are over priced and have limited selection. The first lengha in the photos is bought from here. If you are going soon, order ahead and you don’t have to worry about them being late. These dresses look awesome! So colorful.What’s your favorite? I am glad all my research paid off well :). Will be shopping online in future as well for sure. Wow your photos took my breath away. Looking stunning 😀 Keep smiling that beautiful smile! You look fab in all of them, but I especially love the first two! Oooooh, wow ! ! ! And the colors are gorgeous !